In 1452 Borso d'Este, Marquess of Ferrara, Modena and Reggio (1413-1471) was created Duke of Modena by Emperor Friedrich III on 18-5-1452 and Duke of Ferrara by Pope Paolo II on 12-4-1471. His legitimate line died out in 1597 with Alfonso II, after which Ferrara became part of the Papal State. Emperor Rudolf II recognised Cesare d'Este, Marchese di Montecchio (1562-1628), whose father Alfonso was an illegitimate son of Alfonso I, as Duke of Modena and Reggio. His line died out in 1803 with Ercole III, who had been dispossed by the French in 1797 and who had been compensated with the Duchy of Breisgau in 1797 and the Duchy of Ortenau in 1801. His daughter Maria Ricciarda succeeded her mother in 1790 as Duchess of Massa and Princess of Carrara and married Ferdinand Archduke of Austria. He succeeded his father-in-law in his German possessions, which were however mediatised as part of Baden. Their son Francisco IV was reinstated in Modena in 1814. His son Francesco V fled the country in August 1859 and in December 1859 Modena joined Parma and Tuscany. They were annexed by the Kingsom of Sardinia in March 1860. Francesco V died without male heirs. He left most of his estate to Archduke Franz Ferdinand of Austria (1863-1914) under the condition that he changed his surname to Austria-Este. 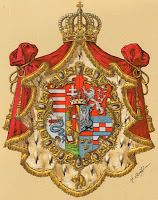 The second son of the future Austrian Emperor Charles was to be the new representative of the Austria-Este family after Franz Ferdinands assassination. Eldest ancestor Adalbert Count of the Saargau and Metz died between 1033 and 1038. He is possibly a descendant of Matfrid (+ 836) Count of Orléans, whose descendants became counts in the Metzgau. Adalberts son Gerhard became Duke of Upper-Lorraine, whose descendants became Dukes of Lorraine until François III Etienne Duke of Lorraine (1708-1765). He married the Habsburg-heiress Maria Theresia Queen of Bohemia and Hungary and Archduchess of Austria and exchanged Lorraine for Tuscany. He became German Emperor in 1745. His younger son Ferdinand Archduke of Austria (1754-1806) married the heiress of Modena. 103. Helen Bogle * … + 24-9-1863; Dr van George B.